Jack just wants a real, authentic Christmas, and he’ll do anything he can to convince the denizens of Halloween Town that this is a good idea. But did you know that Tim Burton’s The Nightmare Before Christmas was laden with just enough repetition to make an effective drinking game? Whether referencing some Christmas tradition, or lamenting about his lack of holiday cheer, Jack is a wonderfully troupey character. However, he’s not the only character to contribute to our drinking game. While we love The Nightmare Before Christmas, it’s sometimes even more enjoyable to poke fun at something that we’re the biggest fans of. We don’t know about you, but we can’t wait to try this The Nightmare Before Christmas drinking game with our friends at all future Halloween parties! 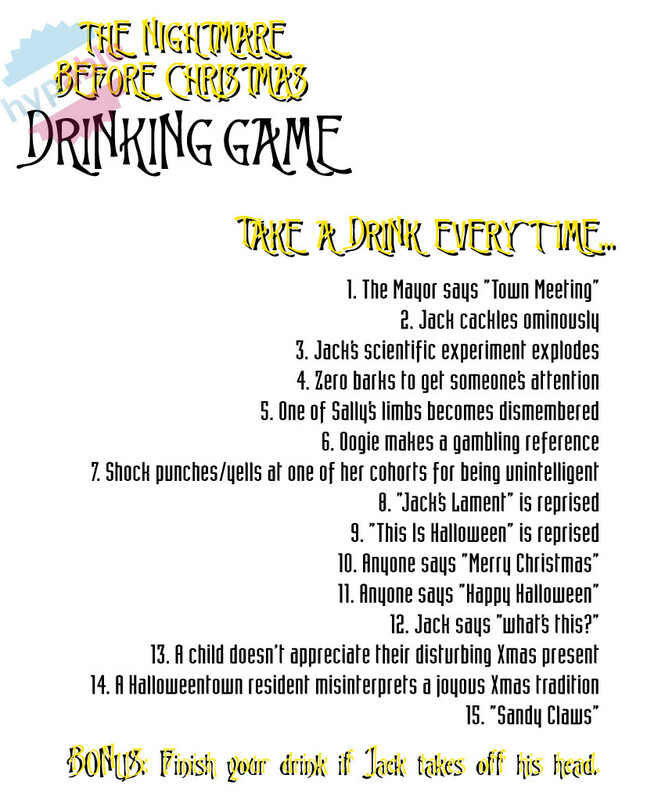 And the best part about this The Nightmare Before Christmas drinking game is that you can play it during the holidays as well. As Disneyland precludes by taking over its The Haunted Mansion ride with a The Nightmare Before Christmas theme from before Halloween until well after Christmas, this movie is themed perfectly for both times of year. While there isn’t a scene that a character actually drinks alcohol in this movie, Sally’s sending Jack her butterfly love bottle was the closest we could get. *Note: Please drink responsibly. This game is not meant to lead a player to becoming ill from the over-consumption of alcohol. This game is meant to be interpreted as satire, and if played, can just as easily be done so with non-alcoholic beverages. Hypable does not in any way promote underage drinking. What’s a drinking game you’d like the Hypable staff to make?